These 39-star flag kerchiefs were the printed commemoratives created to honor the Centennial Exhibition in Philadelphia. They have a fascinating place in American history because a 39 state flag was never put to use| superceded by the admission of the 40th state| to the Union. One kerchief alone is rare and scarce. Described as "The'International Flag'... with an unofficial total of thirty-nine stars in its constellation| is notable not only for its canton-which contains six vertical "rows|" three with six stars and three with seven stars-but also for its border of small flags of the nations that were to attend the United States' hundredth birthday party. 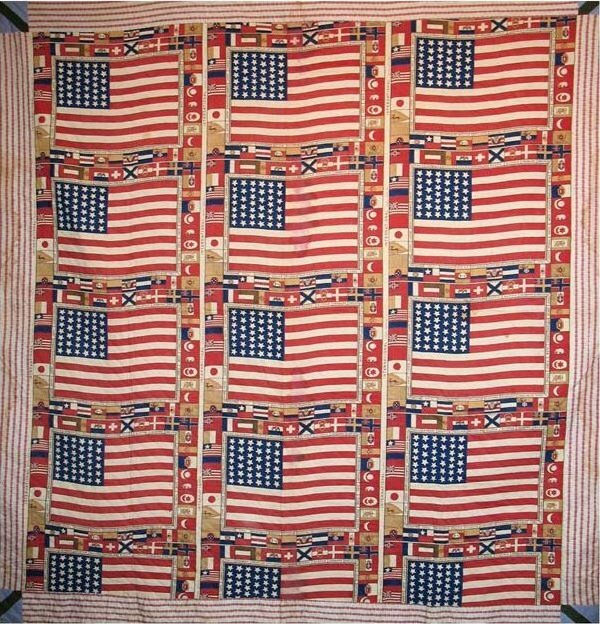 It brings to mind a flag carried by the printers of calico for the July 4| 1788| celebrations in Philadelphia; on that occasion the Stars and Stripes was surrounded by an edge of thirty-seven prints of various colors and carried the motto "May the Union government protect the manufacturers of America." (Mastai| "The Stars and the Stripes: The American Flag as Art and as History from the Birth of the Republic to the Present|" page 162) Said to reflect America's emergence as a world power| a bridge to East and West. American flag surrounded by 38 other nations' flags--Great Britain| France| Germany| Belgium| Holland| Switzerland| Russia| Austria| Denmark| Sweden| Norway| Italy| Spain| Portugal| Turkey| Siam| Tunis| Persia| Egypt| Brazil| Peru| Venezuela| Honduras| Guatemala| Ecuador| Bolivia| Nicaragua| Chili| Argentine| U.S. Columbia| Ireland| China| Japan| Morocco| Sandwich| Hayti| Liberia| and Mexico. Kerchief patented DEC 28. 1875"; 135-year-old rare flag ephemera. Centennial Exhibition held in Fairmount Park| Philadelphia. Historic because of the 39 stars flag| and also visually significant with its multiple imagery| a precursor to some works by Jasper Johns and Andy Warhol. Some dye bleed in one area from moisture.